Leo Hoffman was born with a gift for languages. When his dreams for the future are destroyed by World War I, the dashing young Hungarian attempts to use his rare talent to rebuild his life, only to find himself inadvertently embroiled in an international counterfeiting scheme. Suddenly Leo is wanted across the European continent for a host of crimes, including murder. Left with no options, he escapea to Shanghai with his lover, carrying a stolen treasure that could be his salvation . . . or his death warrant. But the gangsters who control the decadent Asian city have no intention of letting him outrun his past. SHANGHAI, THE PARIS OF THE EAST! In all of my books, my fictional characters interact with real historical figures, and their lives are affected by actual historical events. Heart of Lies takes place during the two World Wars. The main character, Leo Hoffman, becomes inadvertently involved in an international counterfeiting scheme run by members of Hungary’s fledgling fascist party (which actually occurred, pretty much the way I describe it, in 1925). This was because in the 1840′s the crumbling Manchu (Qing) Dynasty signed treaties with several European countries opening up the walled city of Shanghai to foreign trade. On the heels of these agreements came “territoriality” privileges, which meant that citizens of the treaty countries, while in Shanghai, did not live under the jurisdiction of China. Whether your business was legitimate or completely criminal did not matter. Opium smugglers mingled easily with bankers and industrialists. 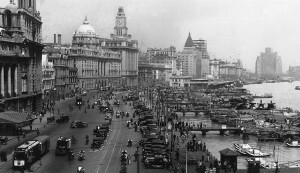 Chinese peasants froze to death on streets where Europeans threw sable covers over their cars on their The bustling Shanghai Bund cars to keep the interior from getting too cold. The infamous Du Yu Sheng. 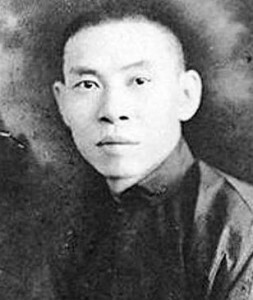 Many characters who occupied Shanghai during its “Golden Era,” (1920 to 1937), would have made intriguing additions to Leo’s story, but I immediately honed in on Du Yu Sheng, who was a leader of the Green Gang, a Mafia-like organization that ran the illegal opium trade, gambling dens, prostitution rings, and protection rackets. Though I changed his name slightly, the gangster who becomes Leo’s nemesis in Heart of Lies is in every other respect true to the notorious real-life Du Yu Sheng.